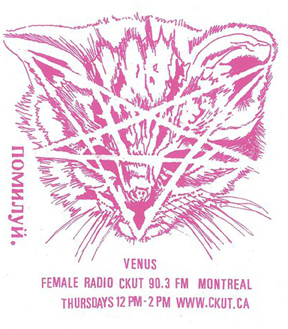 on CKUT 90.3 FM Thursday 12:00-14:00.
on CKUT 90.3 FM Sunday 0:00-2:00. Loosely inspired by evangelical radio formats, the Harvey Christ Radio Hour features storytelling, sermons and hymns – all performed live by Reverend Randy Peters, Reverend Norm, Reverend Anna Montana, Reverend Joalien and Reverend Brian Damage. Harvey Christians satirize dogmatic beliefs – across religion, politics, and pop culture —and mix the serious with the bizarre as an antidote to mainstream radio and religion. They’re a bunch of cockamamie, barn-burnin’ neo-compost-modern evangelical fools; divinely incomprehensible spiritual gurus (-neither beards nor rash); freaks in polyester & wool suits in high summer. Must be heard to be believed. Un jeudi sur deux 21:00-23:00 en alternance avec Francis Et Les Exerciseurs. on CKUT 90.3 FM Sunday 2:00-6:00.
on CKUT 90.3 FM Tuesday 9:00-11:00. Basa means pandemonium and sometimes the listener can sense that while tuned in, harnessed in a way that conveys the energy and passion behind the music. Basa features Africa as the heart and soul of global music, while delving into aspects of African life and culture: you might hear anything from politics to poetry, story-telling, food and anything to do with African life during the show. However, music will always be the main focus of Basa; music is the message. With your host Marty Lebovitz. Tuesday mornings 9am - 11am. on CKUT 90.3 FM Thursday 15:00-17:00.
on CKUT 90.3 FM Sunday 20:00-21:00. On the air since 1991, Country Classics is a show hosted by Katie Moore, Dara Weiss, Julia Kater and Li’l Andy. The show’s mandate is old-time classic country from the ’20s onward while incorporating today’s best roots & country artists with an emphasis on Canada’s burgeoning roots scene. Honkytonk’s best, only on CKUT. Country Classics airs live every Sunday from 8 to 9pm and you can download past shows at the bottom of this page!